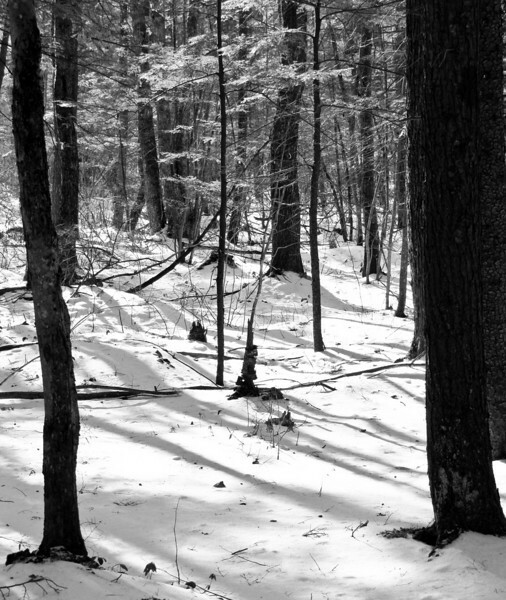 Snow had fallen heavily the day before, but people had already cross-country skied and snow-showed the trails at Rachel Carson NWR, so, with care, a booted photographer could get back pretty far in the woods. These tracks must have been made just before the snow ended. 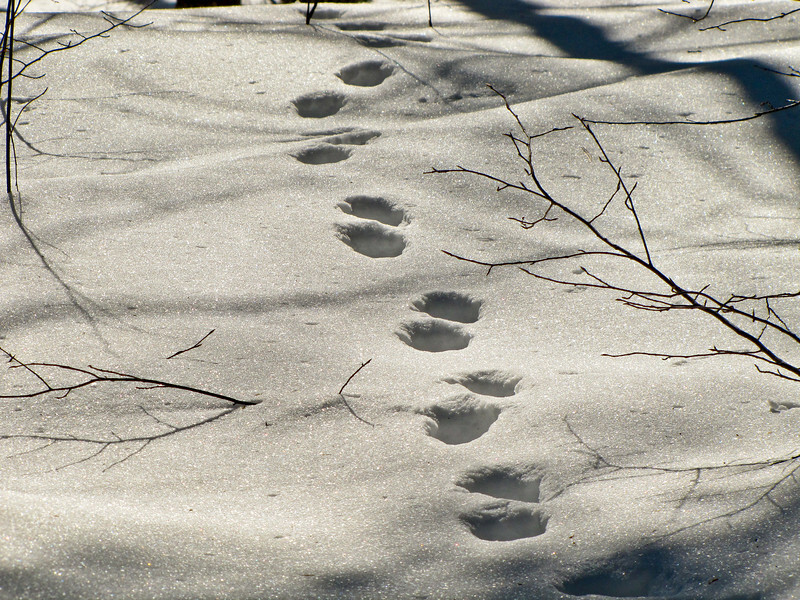 Though I thought I was capturing the tracks, it turns out this is mostly about what the light is doing with the texture of the snow. A Black and White conversion brings that to the forefront. Canon SX20IS at about 285mm equivalent field of view, f5 @ 1/1250th @ ISO 80. Snow Mode. Processed in Lightroom for clarity and sharpness. Converted to B&W using the Green filter effect. And, being Sunday: Like the image itself, our spiritual journey is often more about what the light does with the snow than it is about the tracks we, or others, leave. And yet, without the tracks, what is there to draw another’s eye? We are much more likely to stop to see the light on the snow if someone has laid a track across it. That seems to be a part of what it means to be human. “Who goes there” is our first question. But it eventually leads to the realization that there is a there to go and a going…and that every step, to the eye of the spirit, is through textured light! That is Maine in the title…and I am back from a week of business meetings in Virginia. Though this pic was taken a week ago, it still looks like this in Maine. The snow is a bit more compacted, but there is still plenty on the ground. That is 5 foot snow fence. I still have a number of digiscoped shots from Florida to share, but, for today, I am back in ME. Canon SX20IS at about 45mm equivalent field of view, f4 @ 1/1250th @ ISO 80. Snow Mode. Happy Sunday! 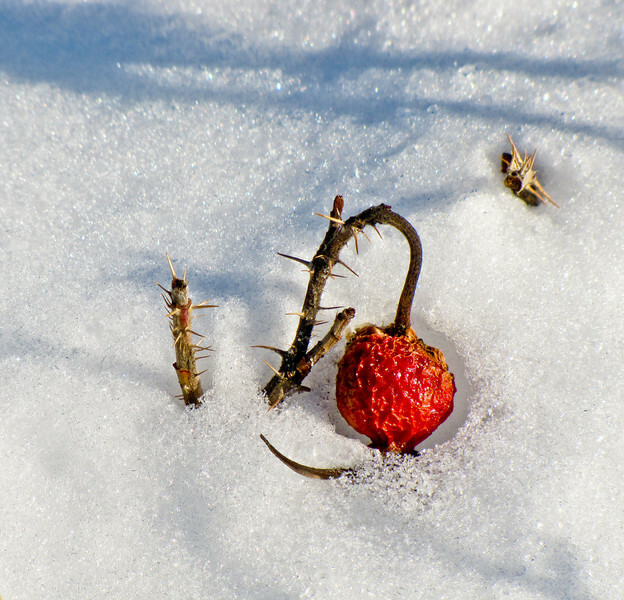 A play of textures, set off by the contrast between the brilliant red of the rosehip and the white of the snow. I also like the way the red of the rosehip has absorbed enough heat from the sun to melt the snow around it and create a little frame for itself. The thorns, to my eye, give it an extra appeal. For this shot I used the tele-macro on the Canon SX20IS, shooting from a standing position and well back, but still getting the macro effect. 560mm equivalent field of view, f5.7 @ 1/800th @ ISO 80. Snow Mode. Processed for intensity and clarity in Lightroom. Cropped from the left to eliminate a distracting out of focus twig, and from the right slightly to more or less restore “rule of thirds” composition. 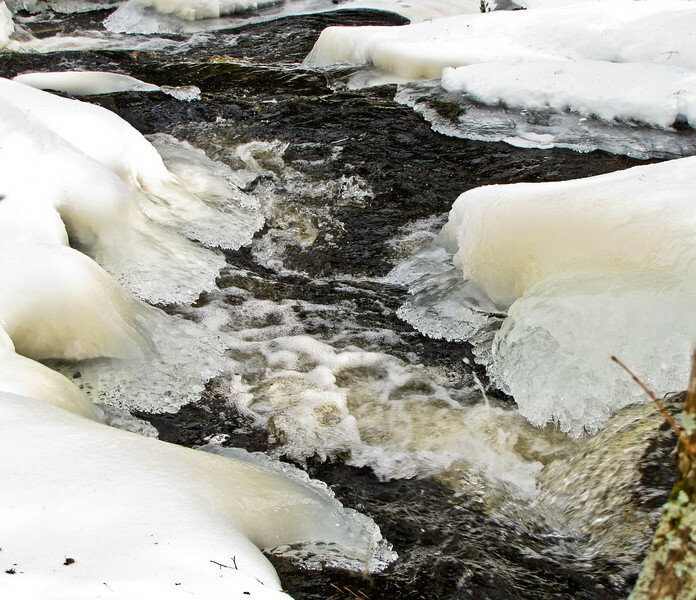 This is part of the sequence of grand snowscapes I shot on Friday. You saw one of them yesterday, taken only a few moments before. As part of my photographic discipline I have trained myself to always, in every situation, spend at least some time looking down, looking close, thinking small…even when the grand vista is compelling. There is often something worth my attention right at my feet. No…there is almost always something interesting right at my feet, if I take the time to look. And often, looking close produces an image which opens out with as much contrast and texture and pattern as the full landscape. Without trying to stretch the metaphor too much, I think there is a spiritual truth there. I would not like to think that, in the grand and thrilling sweep of eternal values that opens to the spiritual eye, I would ever lose the intimate details, the small beauty of what is right at my feet. The poets say the universe is contained in a single grain of sand…or, say I, in a rosehip in the snow. 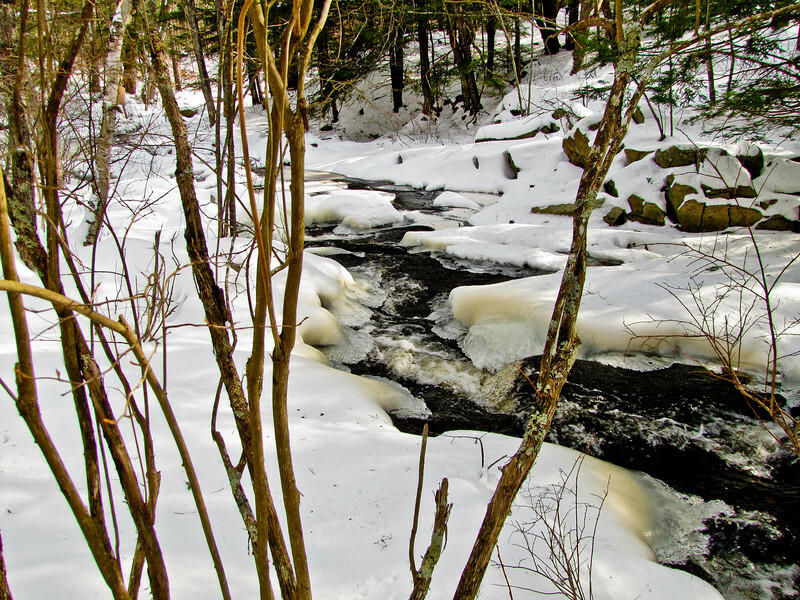 A break from the unrelenting diet of birds, birds, birds of the past two weeks, and a return to my current reality…snowy, snowy Maine. We now have, after another foot fell on Wednesday, and taking into account settling and melting (sublimation actually, since the snow is going directly from ice to vapor without ever being water) about 3 and a half feet of snow standing in our front yard. What you see here is a healthy stand of beach rose. The tallest of those plants tops five feet. This is a perspective shot taken at moderate telephoto. 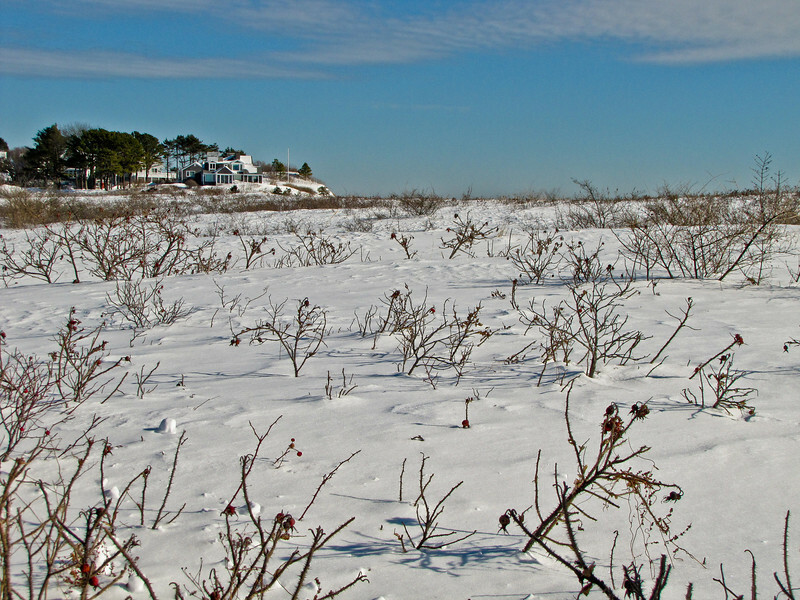 Great Hill with its houses is about an eighth of a mile behind the dune and snow buried rosehips in the foreground, on the far side of the Mousam River. Canon SX20IS at about 70mm equivalent field of view, f4.5 @ 1/1250th @ ISO 80. Snow Mode. When this first posts tomorrow morning, I will be, most likely, at Newark Airport, between flights, on my way to Las Vegas (working trip…which is the only way you will ever get to Las Vegas!). 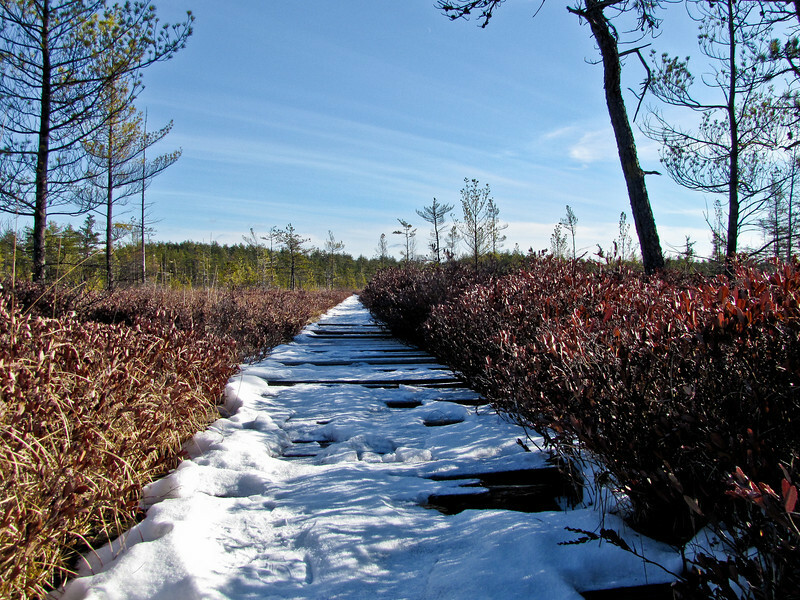 This is Saco Heath again…the boardwalk under snow. There is as much snow on either side, but the blueberry and rhodora bushes hide it well. We got another 16 inches or so the day before yesterday, so it might look different now. :). Canon SX20IS at 28mm equivalent, f4 @ 1/800th @ ISO 80. Snow Mode. The camera was resting on my glove on the snow and I used the flip out LCD to frame. 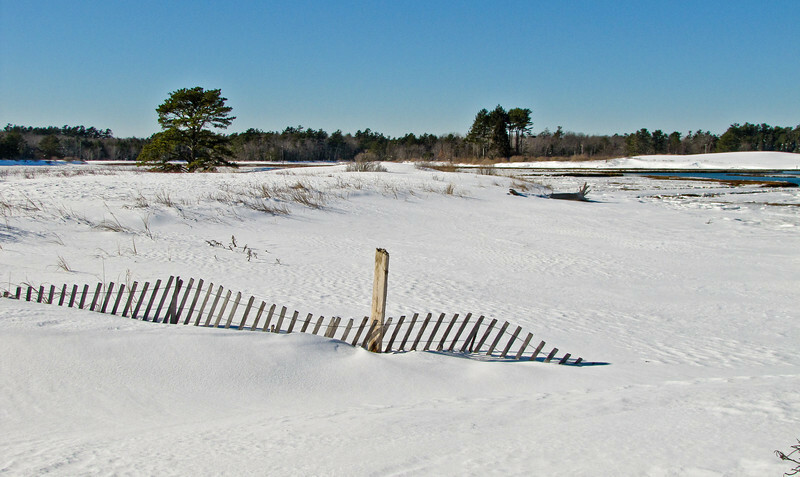 After church on Sunday, my daughter and I stopped at Saco Heath again, just to see what it looked like in winter. She was impressed with the beauty of the light under the tall fur trees where the trail works its way toward the bog, and we were discussing how difficult it is to catch that particular (and undeniable) beauty in a photograph…how the eye and the brain…the mind…absorbs the impression of beauty without needing any center of focus, as we move through the landscape, but how in an image, once you place a frame around it, without that center of focus, the result is, most of the time, just a clutter from which we fail to recapture the original impression. So I took a few shots to demonstrate the limits of what can be done. I explained as I worked and showed her the results that I was also visualizing the image in B&W, using a green filter effect, which lead us to discussions of how B&W photographers used to tailor the light and the response of the film with a whole bag full of different colored filters…how it was, in a very real sense, the one control they had over the image once basic exposure decisions were made. I told her that often, in situations where it is really the light you are photographing, B&W can be more effective, or at least, just as effective as color. So here is the same image processed in Lightroom using the green filter B&W effect. This treatment brings the little fur into some prominence and is perhaps better focused as an image than the color version. I am not sure which I like better, or, even if I like one better. 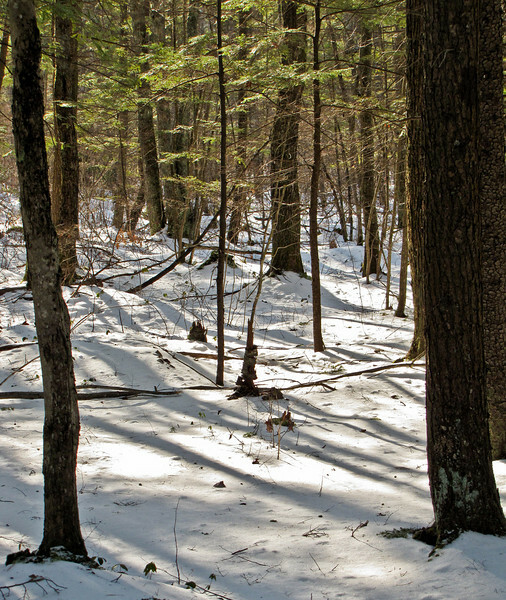 Of their kind, and given the limitations of forest photography, they are both satisfying. Just. Unfortunately the experience is fresh enough so I still remember the impression I was attempting to catch! Canon SX20IS at about 110mm, f4.5 @ 1/160th @ ISO 80. Snow Mode. Processed for light, intensity, and clarity in Lightroom. Cropped for composition. Green filter B&W effect.